Punta Arenas, Magdalena Island, Torres Del Paine National Park, Pudeto, Mount Paine Grande, Lago Grey, Puerto Natales, and more! 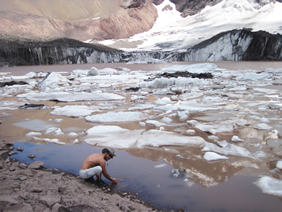 Gay Patagonia group adventure tour - Bottom of the World. Our small gay Chile tour group will revel in the vastness and natural grandeur of this remote region, with a focus on adventure! 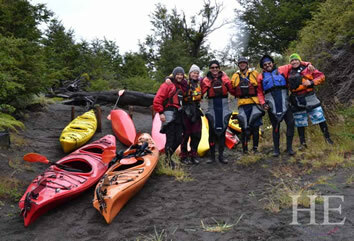 Enjoy hiking and kayaking through the varied terrain of Patagonia, all with a friendly group of gay travelers! 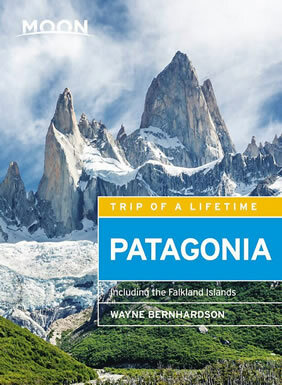 The name Patagonia conjures images of towering craggy mountains, pristine valleys with shimmering creeks and rocky trails, frothing waterfalls, and rolling pastures dotted with sheep and cattle. Our small, gay Chile tour group will gather in the capital of this Southernmost Region, Puntas Arenas, Chile, sometimes referred to as the access gate to “The End of The World.” We will admire and marvel at the natural splendor and unique wildlife of this wild and wooly region. This trip is packed with adventure after adventure, and we will have plenty of time outside to enjoy this amazingly unique region. When we’re not kayaking or hiking our group will be breathing deep and appreciating the vastness of the endless sky together. • Hike through lush mountain greenery to visit waterfalls and Glaciers. 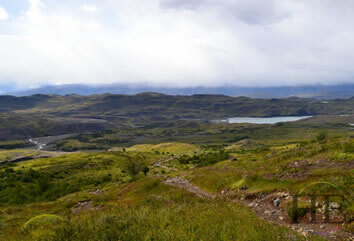 • Breathe the crisp, pristine air and enjoy the unspoiled beauty of Torres del Paine National Park. • Visit the Magellan Penguins in their natural habitat. • Kayak alongside the towering turquoise icebergs in the cold, clean waters of Gray Lake. • Cruise through pristine waters past glacial ice and snow-capped mountains. Day 1 - Welcome to Punta Arenas, Chile! We will be greeted warmly at the airport by our local guide and transported to our hotel. After checking into our lovely and comfortable hotel in the heart of the city you will have the rest of the day to recover from your long flights. No activities scheduled for today, enjoy our centrally located hotel. Sleep in today and enjoy a morning of leisure. This afternoon our well-informed local guide will bring us to our first stop, the “Cerro de la Cruz” viewpoint. From here we will have a wonderful overlook of the city with its colonial buildings and colorful rooftops set against a backdrop of the big island of Tierra del Fuego and the Strait of Magellan. You will learn lots of interesting facts about this vibrant city, as your tour continues with stops in the main town square, the monument to Hernando de Magallanes, the Museo Nao Victoria (Nao Victoria Museum), Antoine de Saint Exupery Square, and all the highlights, including the many neighborhoods of Puntas Arenas We will return to our hotel to freshen up for the evening. This evening we will come together for a welcome dinner and orientation at one of Punta Arenas most delicious downtown restaurants. Rise and shine, let's grab some breakfast! We will need our energy for our exciting trip to Magdalena Island! Tonight we dine together at a nearby locally recommended restaurant. 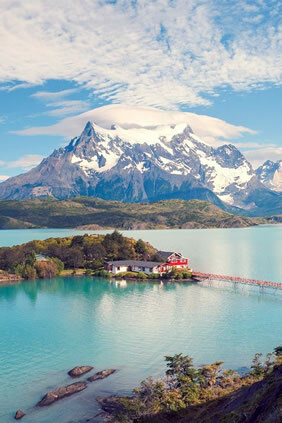 Today after breakfast we will get an early start on the trip to our magnificent lodge in Torres Del Paine National Park, home to Chile's iconic snow-capped peaks. These jagged mountaintops with sheer cliff faces are one of Patagonia's most photographed landmarks, so make sure your batteries are charged! This scenic journey will take us north along the Argentinean border and we will the National Park near the middle. Hungry? We will stop mid-day for lunch before we finish the trek to our remote mountain lodge. After checking in, it's time for relaxation! Grab a drink at the open bar or hit the spa for a massage, and then join us for a delicious dinner together. Day 5 - To the Towers! It will be a gorgeous day with amazing views as we hike into the mountains to visit las Torres (the Towers). About a third of the way there, we’ll stop and enjoy a steaming cup of hot cocoa at a warm and cozy relief station that caters to the backpackers who come from all over the world to hike these awe-inspiring mountains. 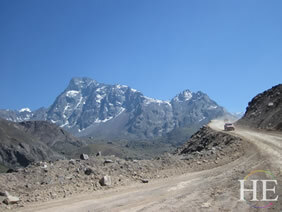 We will continue on foot to the base of Las Torres, and take a well-deserved rest. This is a long day of trekking over a variety of terrain. As we unpack our box lunch and eat together, we will marvel at the spectacular 360-degree mountain views. Grab some breakfast, and off we go! Today we will travel to Pudeto and board the "Hielos Patagonicos" Ferry to navigate across Pehoe Lake, one of the most dramatically beautiful bodies of water on this planet. Once we have successfully crossed, we will start our trek up toward the majestic French Valley. During our hike we will be surrounded by lakes, rivers and streams, and a wonderful view of the Paine Massif, part of the Eastern spur of The Andes. Once we arrive at the foot of Mount Paine Grande, the biggest and the baddest of all the spires, we will be able to rest in front of the French Glacier, eat our delicious picnic lunch, and witness the place where the most spectacular and impressive avalanches often occur. After our arrival and check-in at our new lodge, we will regroup in the evening and enjoy dinner and a good nights sleep, we've earned it! Enjoy a hearty breakfast at the hotel this morning because we will be trekking out little hearts out today! Our adventure begins by boarding our sturdy vessel for a magical one hour journey on Grey Lake, surrounded by icebergs! Upon our arrival at our base camp, our experienced guides will give us the orientation we will need for our glacier approach. After a short ride in our zodiac boats, we arrive at the west side of the awe inspiring Grey Glacier. After our boxed lunch together, we will hike for an hour, and then begin our full exploration of this marvel of rock and ice. During the next three hours of trekking, we'll observe cracks, rivers, lagoons and tunnels in the glacier, with a myriad of shades of blue, who knew there was so much color and diversity in ice? After we have conquered Grey Glacier, our ship will bring us back through the Southern Patagonia Ice Fields to our lodge for a homemade dinner and some well deserved relaxation! We'll depart bright and early after breakfast today in order to gear up for kayaking. Safety first, and our options for the day are weather dependent: if good, we kayak among and up to the turquoise icebergs. If the weather does not permit us to cross the open water, we'll kayak downriver stopping for a snack along the way. Spectacular views await along either route! Our kayak journey will finish where the Grey River meets with the Serrano River, as we have passed past the impressive granite walls of the Paine Mountains in all their majesty. Once warm and dry, we'll load up for our drive to Puerto Natales to check into our hotel, enjoy the sea views, and share stories with our friends over dinner. Weather permitting, we have yet another great excursion together! Our journey starts at the hotel pier where the boats from the hotel will be ready to take us sailing, gliding through the Patagonia Fjords, and visiting both Balmaceda and Serrano Glaciers. We will observe colonies of blue-eyed cormorants and sea lions frolicking in their natural habitat, maybe even posing for a photo or two. When we disembark in Puerto Toro and Bernardo O´Higgins National Park, a short hike will take us to the viewpoint overlooking Glacier Serrano, bordering a lagoon with icebergs that are coming out right from its base! We will return to our sailing boat and continue our journey to the Balmaceda Glacier with impressive views all around. Lunch will be served during this excursion, and then we are heading back to town. This afternoon, we will take advantage of some free time for last minute photos, shopping, or just strolling along the beautiful waterfront. Feel like some more exercise? How about a leisurely bike ride? We will have one for you if you so desire. Tonight, we will put the "Happy" in "Happy Hour," as we join with our new found friends to smile and laugh, finally dining together at our Farewell Dinner. After breakfast at our hotel, we will transfer to the airport for homeward bound flights with memories to last a lifetime. • Admission fees to all locations listed in itinerary. 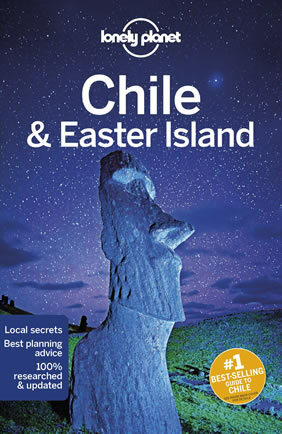 This tour starts Punta Arenas and ends in Puerto Natales, Chile. 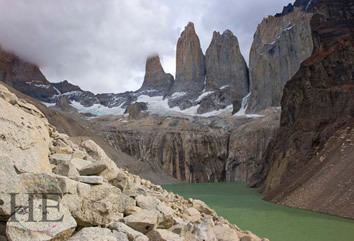 Patagonia is home to some of the most exciting adventure sports in South America. 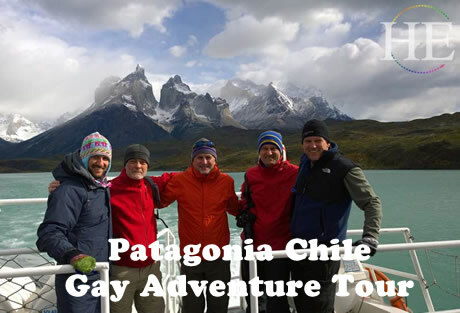 Our Gay Patagonia Adventure tour offers travelers the chance to experience unique settings while trying new adventures. 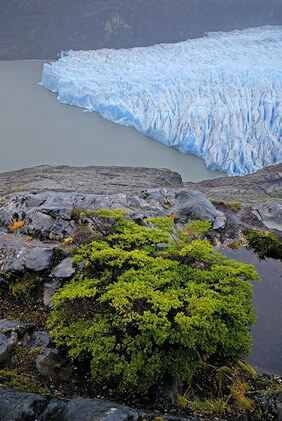 Hiking to glaciers, kayaking around icebergs, and more are available on this trip. If you are in good physical shape and like a moderate challenge, this trip is for you. Each night will be spent in warm and comfortable hotels.